Our business card draw has found another winner, this time from the Modern Claims Conference at Stamford Bridge last month. The lucky winner’s name was drawn by Ontime Group’s own Rebecca Stevens, and the Champagne and cooler was presented to Hilary Meredith’s Stevie Tatton yesterday, who promised not to share it with Hilary! But don’t confuse the award winning scarecrow in the picture for James Molloy – he was safely behind the camera! 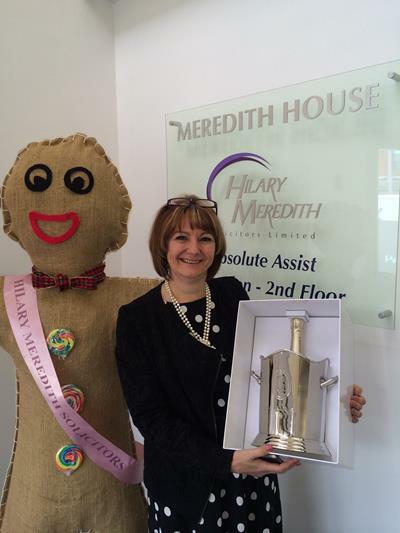 This entry was posted in Blog, Press Releases and tagged Hilary Meredith, Ontime Group, Prize Draw, Stevie Tatton. Bookmark the permalink. Both comments and trackbacks are currently closed.